Composed by Jamey Aebersold. Play-Along series with accompaniment CD. Jamey Aebersold Play-A-Long series. Book & CD. Published by Jamey Aebersold Jazz (JA.V01DS). This is the culmination of Jamey's 30 years as one of the world's leading jazz exponents. 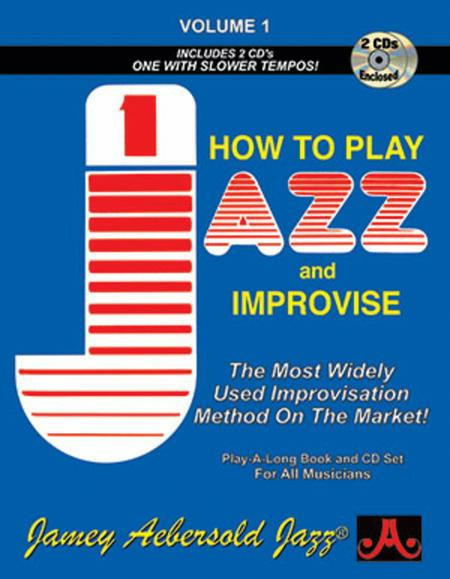 Volume 1 has unlocked the mysteries of jazz improv for a whole generation of musicians who previously had nowhere to turn. Easy to understand and inspiring for all musicians wishing to explore the secrets of jazz improv. Includes 2 CDs - one at slower practice tempos - of blues in Bb and F, four dorian minor tracks, four-measure cadences, cycle of dominants, 24-measure song, II/V7 in all keys. Book includes transposed parts for all instruments. The CD includes Jamey playing exercises from the book. Hear the master clinician show you exactly how it's done! Little disappointed in the way organized and overall format . Okay , but expected more !! 45 of 102 people found this review helpful. 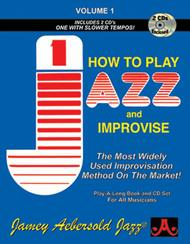 I found the book confusing and would be better if they had sample licks for each style of jazz. 50 of 113 people found this review helpful. tendency to state "rules", but that simplifies things for beginners. The exercises/CD itself probably are beginner/int level. I like the encouragement written in the text and some of the more cerebral material. I hate the constant plugging of other products (though I got sucked in by the Major/Minor workout...), although he does mention non-JA products as well. There is a tendency to state "rules", but that simplifies things for beginners. 71 of 139 people found this review helpful. of one's instrument to get the best use out of this book-or take lessons with a good teacher to help you with your technique,as the book starts out at a medium level,but progresses very rapidly.Don't try to get the grasp of the whole book quickly-take your time with it.I also recommend Jamey's Anyone Can Improvise video and Volume 24 as companions to go along with Volume 1.Overall,this book will challenge you,but if you're serious about learning how to play jazz,this is a good place to start.And don't forget to listen to good jazz music everyday.Enjoy!!! 70 of 142 people found this review helpful. books. I wish I'd listened. 86 of 145 people found this review helpful.